One of the ways I entertain myself when driving back to Ruston or to Austin is by timing my trips. I am always on a quest to better my time-even by a minute. If the stars line up right, the traffic cooperates, and my bladder control is extensive, there is always the possibility of a better time. Don’t judge—I am easily entertained! On my recent trip home from Ruston, everything was perfect to have the best time EVER and by several minutes. I was rocking & rolling and already gloating to myself over the new “Best”! Already in the “DFW Zone”, I was in the home stretch when I topped a hill and DRAT, cars are braking in all lanes and things seem to be coming to a stop. All four lanes of traffic are at a crawl and the game was on for which lane would move me the fastest. 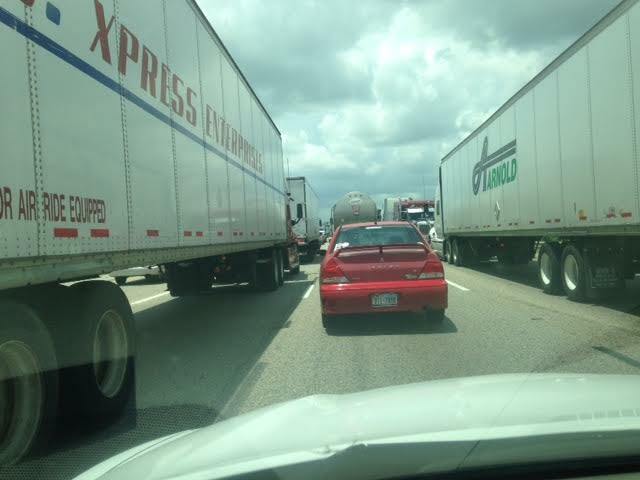 Seriously---they had closed down the entire interstate---just south of Dallas—both ways---all lanes! As we slowly creeped forward, I wanted to jump out of the car and demand to see the person in authority. Pulling myself up to my most intimidating 5’5” and 120 pounds, demanding to know “WHO THOUGHT THIS WAS A GOOD IDEA?” When I turn my stink eye on you and stand up tall, I really can be quite intimidating! Somehow we finally get four lanes of traffic down to one and we all are herded off unto another interstate. Approximately 2 miles down the road, there is another sign---all detoured traffic is required to exit—in a single lane again, and take a single lane road which will eventually get you back unto the interstate. OH—BUT I have a BETTER idea—instead of going as directed—I will continue on to Dallas and take the interstate that runs two blocks from my house. BRILLIANT---until I get to downtown Dallas and discover three interstates all merge together at this point and AGAIN traffic is at a crawl. Once again, I end up in a single line of traffic which is crawling. What else is there to do, but stay in line—be patient-and eventually I will get home. By this point in time, all hope of a smooth path leading to a new best time, are shattered—I am just praying to get home without being smooched into a grease spot between two 18 wheelers! Eventually I get out of Dallas---all the interstates have gone their separate ways and I am headed to Fort Worth! HAPPY- HAPPY! And THEN I get to Arlington, famous for its amusement parks, Ranger’s Stadium, and various and other forms of entertainment. It seems every parent and child in a three state area has decided this day is THE day to go to Arlington. Once again—traffic is crawling! Eventually I get home---THANK YOU, LORD! NO new record—no smooth sailing, but I am home in one piece and there is truly no place like home. The day has been spent receiving and extending grace as all of us road warriors work together as we merge and converge on the path home. Reminds me of the path of life—unexpected detours---receiving grace—extending grace—lots of patience required—accepting where the path leads—and knowing eventually we will be home. Knowing even though the path does not look like we planned—our Guide knows the best route---and the best road---WILL lead us home. All I can say is it was memorable ! Sigh ... this is exactly why I adore country living. Pure and simple! Hope you're recovering from it all, Lulu! Living in the city is not for the faint of heart, Friend!